The term “Temperature” is a physical parameter and it can be measured in units of degrees. It is a critical part of any method to measure precise temperature. The usual applications needful accurate temperature quantities include medical, electrical or electronic studies, biology research, materials research, etc. A Temperature Sensor is used to measure the heat energy amount that let us detect a physical variation in temperature, generating either an analog or digital output. In general, there are two types of sensing methods are available, namely contact type temperature sensors and non-contact type temperature sensors. The contact type temperature sensor is in physical contact with the substance or object. These sensors are used to measure the temperature of solids, liquids or gases. Non-contact type temperature sensors are used to detect temperature by interrupting a part of the emitted IR energy of the substance and detecting its intensity. These sensors can be used to measure only the temperature of solids and liquids. It is not potential to use them on gases due to their transparent nature. The different types of temperature sensors available in the market can vary from simple ON/OFF thermostatic devices to highly sensitive semiconductor devices. The two basic types of physical temperature sensors like contact and non-contact are further categorized into a voltage, resistive, and electromechanical sensors. The most commonly used temperature sensors are classified into three types such as Thermistors, thermocouples, and resistance temperature detectors.These sensors vary from each other in terms of working parameters. For modest temperature series applications, solid state sensors are also accessible which give the advantage of simple interface and incorporated signal conditioning. The thermistor is a temperature sensing device that changes the physical resistance with the temperature. Generally, these devices are made from ceramic material semiconductor like cobalt, manganese. It is shaped into small pressed hermetically closed discs that give a comparatively fast response to any temperature variations. Due to the properties of a semiconductor material, these devices have an NTC (negative temperature coefficient), i.e. the resistance falls with the rise in temperature. But, there are also Thermistors available with PTC (positive temperature coefficient), their resistance rises with the rise in temperature. The thermistor is rated by their resistance value at room temperature, the time constant, and power rating. 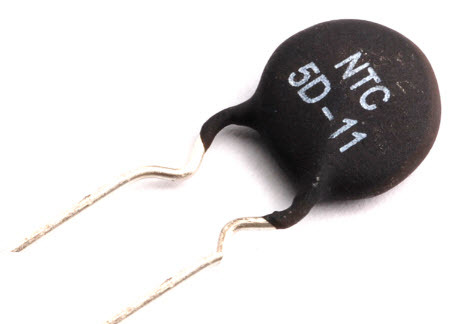 The thermistor is a passive resistive device, that requires current to generate an o/p voltage. Generally, they are connected in series with an appropriate biasing resistor to form a potential divider network. Consider a thermistor with a value of resistance 2.5KΩ at 30°C of and 30Ω at 60°C. Here, the thermistor is connected in series with a 1kΩ resistor across a 5V power supply. By substituting the specific resistor value with a potentiometer, we can get an o/p voltage at a prearranged temperature. Though, it is significant to note that typical resistance values are dissimilar at room temperature for different types of thermistors since they are non-linear. Thermistor has an exponential transform with temperature; so it has a temperature constant (Beta) that is used to analyze its resistance for a given temperature. Though in a voltage divider network, the current which is obtained from the applied voltage is linear with temperature, therefore the o/p voltage across the resistor & temperature are linearly related. The advantages of Thermistors include the following. The speed of response is better to changes in accuracy, temperature, and repeatability. 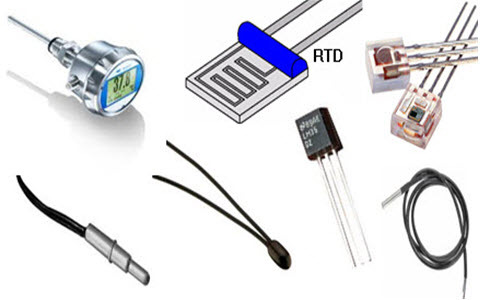 The term RTD stands for “Resistive Temperature Detector” is an electrical resistance temperature sensor that is made of coils of metals or films like platinum whose electrical resistance is a role of temperature. Resistive Temperature Detectors have PTC (positive temperature coefficients) and not like Thermistors, they offer precise temperature measurements since they have linear output. But, they have poor sensitivity generating a small o/p change, for instance, 1Ω/°C for a temperature change. Pt100 has been the most frequently available sensor with a typical resistance value of 100Ω at 0°C. The main drawback is its high cost. How to Use Resistive Temperature Detectors? Resistive temperature detectors are passive resistor devices such as Thermistors and the flow of current through the sensor to get an o/p voltage is linearly connected to the temperature. But, an error can happen in the reading due to the variation in resistance caused by the self-heating of the flow of current through the resistive wires. To overcome this difficulty, a resistive temperature detector is connected to a resistive bridge n/w with additional connecting wires for lead compensation and/or adding of a constant current source. 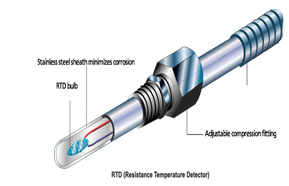 The advantages of resistive temperature detectors include the following. RTDs are more linear compared to Thermistors and thermocouples. 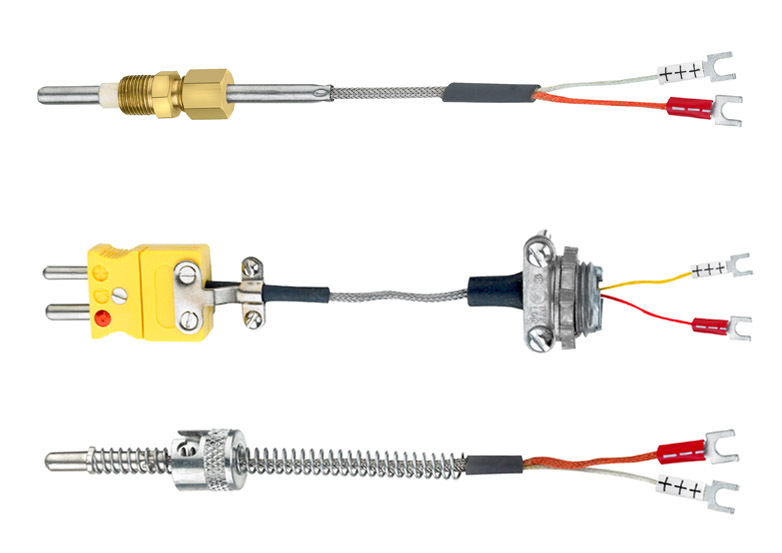 Thermocouples are the most commonly used temperature sensors due to some features like a wide temperature range from below -200°C to over 2000°C, accurate, and are relatively low-cost. The construction of a Thermocouple can be done with two different metals that are soldered together producing a slight potential difference (mV) as a function of temperature. One junction is kept at a constant temperature named the reference junction, while the other is the measuring junction. With the temperature difference between the two junctions, a voltage is established across the junction which is used to measure the temperature. The Seebeck effect can be defined as the voltage difference between the two junctions. If both junctions are at the similar temperature, the potential difference through the junctions is zero, i.e. V1 = V2. However, when the junctions are at dissimilar temperatures connected in a circuit, the o/p voltage is comparable to the temperature difference between the two junctions, i.e. V1 – V2. Thermocouples are existing in different materials and temperature ranges; therefore there are different kinds of thermocouples available for precise applications as set by international standards such as E, J, K, N, T, and U. Where, type J &K are the most frequently used thermocouples. How to Use a Thermocouple? Thermocouple gives a few millivolts output voltage for a temperature change of 10°C. So, it is mandatory to increase the output voltage. It is essential to carefully choose an amplifier to get good drift stability for stopping recalibration of the thermocouple. This makes an Op-Amp (operational amplifier) desirable for most applications. Thus, this is all about different types of temperature sensors.We hope that you have got a better understanding of this concept.Furthermore, any doubts regarding this concept or to implement any temperature sensor based projects please comment in the comment section below.